Home | Fiber Cement Siding | Costs | Best value: new vinyl siding or fiber cement? Best value: new vinyl siding or fiber cement? If you are thinking of residing your home, you have a lot of options and a lot of quality building materials to choose from. Two of the most popular cladding materials in use today are vinyl and fiber cement siding, and each material has its own benefits. Here's a quick rundown on both materials to help you decide which product best fits your home and your budget. Vinyl is the most popular cladding material by market share, says the Fredonia Group of Cleveland, Ohio, in its comprehensive market survey of the wall cladding industry. Vinyl has enjoyed a 30 to 40 percent market share -- the highest among any cladding material -- from 1998 through 2010, says the U.S. Census Bureau in its survey of cladding on new homes sold in the U.S. under $500,000. Regionally, vinyl has an 84 percent market share in the Northeast, and 70 percent in the Midwest. The reason it's the leader? Vinyl is the most energy efficient plastic, it's extremely durable, and it's flame resistant, says the Vinyl Siding Institute of Washington, D.C. Vinyl also is among the least-expensive cladding materials. Vinyl siding costs run between $3 and $7 per square foot, excluding installation costs. 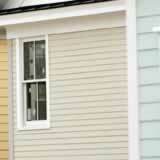 Royal Building Products, CertainTeed and Mastic are among the premier U.S. vinyl siding manufacturers. Fiber cement held a 12.6 percent market share in the cladding industry, the Census Bureau reports -- but the product is relatively new to the market compared to other types of cladding. It has won numerous awards in recent years as an innovative building product. Its main benefits are consistency, durability, dimensional stability and freeze-thaw protection. It's fireproof and insect-proof, as well as highly resistant to ultraviolet damage from the sun's rays. It can also withstand the harsh conditions that plague seaside homes. Fiber cement board comes at a premium, though. It's much heavier and more difficult to install than vinyl, and it's also more expensive -- fiber cement costs run between $4.50 and $9 a square foot. James Hardie Building Products, MAXITILE and Nichiha are some of the predominant fiber cement manufacturers. Both materials are well respected by professional builders. Vinyl remains the most popular choice due to its lower cost, but foam-backed or premium vinyl cladding is nearly as expensive as fiber cement. Consult with one of the pre-screened, certified siding contractors you can find through this website to determine which type of cladding is the best buy for your home. How do exterior accents affect fiber cement cost?